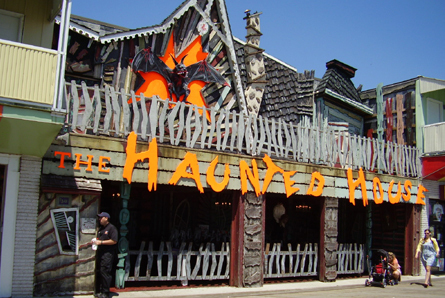 The Haunted House, located at Trimper's Amusements in Ocean City, Maryland, is one of the last remaining Bill Tracy attractions left in the world. Originally built in 1964 and expanded in 1988 to two stories, this five-minute-long attraction offers ride-goers a glimpse into the mind of Tracy as they creep through his virtual catalog of vintage dark ride stunts from the 1960s, as well as several modern-day effects. As visitors venture through the attraction in a vessel modeled after an antique coffin complete with "Rest In Peace" stamped on the back, they will find themselves disoriented in crooked passageways, turned inside-out as they are forced through a spinning vortex, suddenly upside-down in one of the mansion's bedrooms, frightened as they come face-to-face with an oncoming locomotive, and terrified, or amused, by Bill Tracy's unforgettable stunts. Such classic Tracy stunts as the Knit Wit, Old Mill, Swamp Ghost, Falling Barrels, Last Drop, and Cuckoo Clock can be seen in this one-of-a-kind seaside treasure. In all, there are over 20 original stunts remaining in the attraction making it one of the most "True to Tracy" dark rides left in existence. 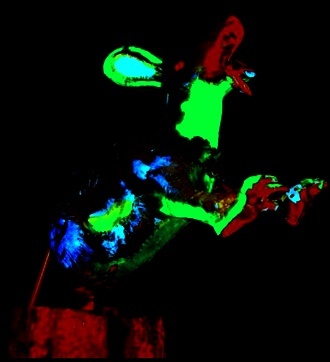 For those who enjoy modernized horror effects, the ride includes nearly 15 stunts and props from industry leaders such as Scarefactory and Distortions Unlimited. Ocean City boardwalk visitors of all ages have had the pleasure of enjoying Trimper's Haunted House for nearly five decades, and thanks to the dedication of the late Granville Trimper and the Trimper family, who recently gave the ride a facelift for the 2012 season, they will be able to enjoy it for decades to come, and continue to celebrate the attraction's true value and historical significance.